As anyone with indoor cats can tell you, there are drawbacks to our lovable furry companions, no matter how sweet they are when they warm your lap while you read a book, or how adorable they are when playing with their carpeted cat tree. When I say "drawbacks", I'm really only talking about one in particular: the litter box. It can be messy, especially if you have cats who like to be, er, vigorous with their ablutions. Whenever you change it and add clean litter, dust flies up into your face, especially if you're using one of the clay clumping types, which most of us do, because hey, it clumps! That's convenient for cleaning and eliminating smelly odors. Because if we're being honest, those odors are the number one litter box drawback. Especially if you're like me, and cleaning the damn thing every single day is most likely not going to happen. 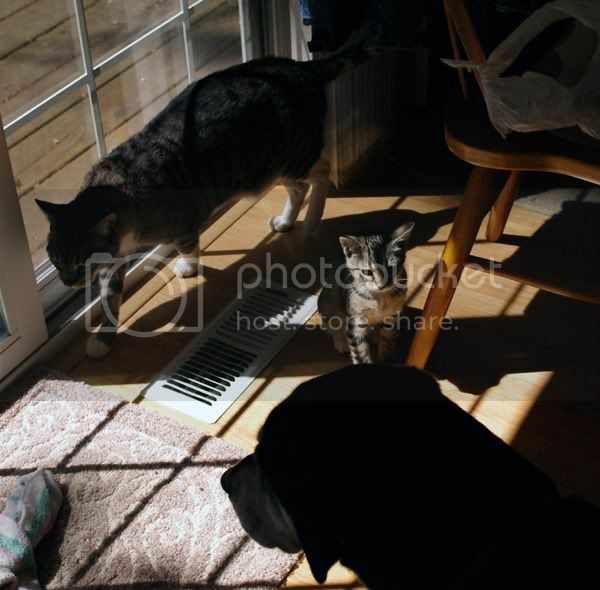 It's a perspective shot, so you can see just how small she is beside our other cat, Julius, and our dog, Zoey. Nimue weighs 3.4 pounds, or she did two days ago. Now she's probably 4.something, but I'll say this about her. She's 60 pounds of trouble in a tiny, 4 pound package. Good thing she's adorable. But back on topic. When we rescued Nimue, I wanted to keep her in her own space for the first couple of days, which required a makeshift litter box of her own. Now, I normally buy my litter at Costco. The stuff in the green jug that weighs half a ton and costs $6.99 is the best clumping litter I'd ever been able to find. Every time I got lazy and bought some other brand, whether it was Arm & Hammer Baking Soda stuff, or Petco's brand, I regretted it. Nothing kept the smell down or clumped as well as Costco's stuff. But I knew I didn't have enough left to make a whole new litter box, and I wasn't going to make a special trip to Costco to buy some. As anyone who shops there knows, there is no such thing as an in-and-out quick trip to Costco. Parking alone is always an adventure. So, I stopped by my local grocery store and ventured down the pet aisle to find something cheap and clumping that I could use just for a couple of days for Nimue. This lone package of One Earth Cat Litter caught my eye. It's an "all-natural" litter made of corn cob husks, pine, and yucca to mask scent. It was on sale for the same price as the regular clumping stuff, so I thought "why not?" I'm always looking for new ways to be environmentally friendly, and if it sucked, I was only planning on using it in the short term, anyway. So, I bought it, brought it home, and made up the new "litter box" from a cardboard box lined with a garbage bag. For someone used to the standard gray sand clumping litter "look", it definitely looks a little strange. It's...colorful. And made up of all these little misshapen shavings that are distinctly not sand-like. It says on the package that it clumps better than standard clumping litters, but I had serious doubts. But I did notice the smell. It had a pleasant kind of scent, not overpowering, like some "scented" litters can have, but definitely there. Nimue passed her two days in the room with her own litter box, and I noticed it did clump. In fact, it covered kitty turds more completely than the clumping clay ever has, and had no problem clumping kitty pee. When the two days were up, I decided to change out the main litter box with the new litter, to see how it handled two cats. To my surprise, it took two cats in stride completely. In fact, my husband Mr. Sensitive Nose commented that he wasn't smelling the litter box as much as normal. Neither was I. Then I went to clean it, and found no dust puffed up into my face. Not only that, but my adult cat's urine didn't form these gigantic half pound clumps. They stayed small and manageable. So far, I have found no cons at all to this stuff. It functions as it's supposed to, and does a better job on all points than the stuff I used to love. This is officially my new favorite litter! I suppose a con would be difficulty in finding it, and another would be price. It's kind of spendy compared to the Costco litter I used to buy. But worth it, in my opinion. 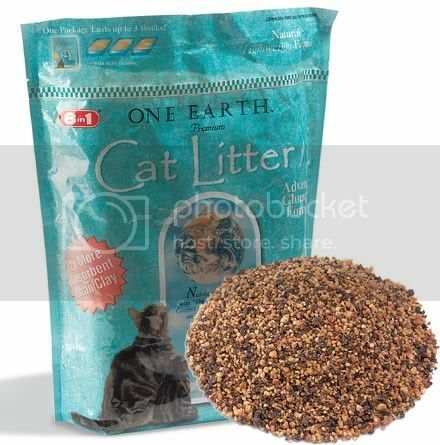 So, for those of you looking for an effective cat litter that is environmentally friendly, I give One Earth two thumbs up! We got three litten kittens a couple weeks ago. Our beloved and elderly cats, Merlin and Ford, died in January. We weren't planning on cats again so soon, but these kittens spoke to us. We're going to start toilet training them in a couple weeks. This Litter Kwitter product looks good and makes a lot of sense. I know that cats can use a toilet because one of my old cats, Snowball trained himself to use the toilet years ago. We couldn't figure out who wasn't flushing until we caught him on the bowl. My sympathies on the loss of your cats. :( It's always such a hard thing to go through. Lucky kittens, to find such a good home. I have found that often in the wake of grief, adorable antics that make you smile and even laugh are often helpful.